Vita & Area’s town-wide winter festival is kicking off for its second year, featuring dog sled races, skijoring races, skating, maple taffy making, sleigh rides, a toboggan hill and more. It’s here, it’s finally here! Ice Castles is an awe-inspiring outdoor experience that brings fairytales to life through interactive ice structures. Expect to be mesmerized by ice that lights up and twinkles to music as you wander through a magical environment of ice-carved slides, frozen thrones, fountains and maze-like tunnels. Want to learn the fine art of beadwork? Start by creating a beautiful pair of beaded gauntlets! Workshops are starting up again at the Le Musée de Saint-Boniface Museum on January 11! Last year’s session sold out quickly, so don’t wait to secure your spot. Visit Bruce at the Canadian Fossil Discover Centre. If it has been a while since your last visit to the Canadian Fossil Discovery Centre, or you haven’t yet had a chance to take it all in, we encourage you to take a journey back in time and get ready to be amazed by Canada’s largest collection of fossils, including Guinness World Record holding Bruce, the largest mosasaur in the world. FortWhyte Alive is a winter paradise! Get free admission this Saturday with events like free learn to ski workshops and free use of ski/snowshoe equipment. Did we mention it’s FREE? Don’t forget your skates and toboggans for skating and for taking on the exhilarating Richardson Run. Join in the excitement and help cheer on a local team in Brandon, Manitoba. Hit the road and go west to catch the Brandon Wheat Kings take on the Edmonton Oil Kings on January 9, the Calgary Hitmen on January 12 and the Medicine Hat Tigers on January 12. 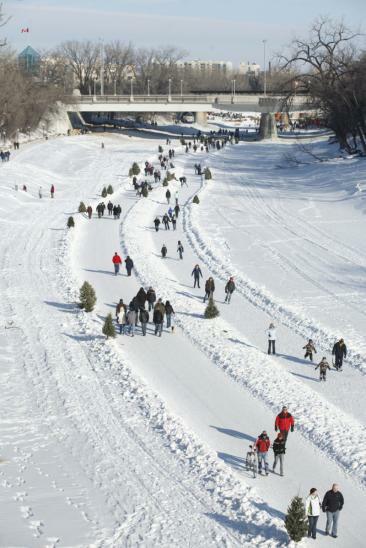 It just wouldn’t be a Winnipeg winter without a skate down the Red River Mutual Trail. The trail is currently open to The Forks Port to Legislature to Osborne Village. Keep your eyes peeled for warming huts! The Winter Survival Interpretive Program in Spruce Woods Provincial Park will prepare you for emergencies in the bitter cold. Learn how to build a quinzhee snow shelter, start an emergency fire and how to prepare for the worst case scenario. Tired of being the bridesmaid and never the bride? You’re not alone. Runaway Bridesmaids features four women who embark on a bachelorette trip with a goal of searching for husbands of their own. This hilarious romp is set to the classic wedding song playlist that we all know and love. More than just the art…is the brain child of artists Pauline Braun and Audrey Lute, based on a set of Artist’s Book Ideation Cards designed for book artist. In this project, 52 artists were invited to choose a card randomly from the book to get a “recipe” for their piece, on display starting January 9 at the Portage and District Arts Centre and Gallery. Manitoba’s lakes are fairly notorious in the fishing world, and for good reason. Home of the Master Angler fishing program, anglers from all over the world gather to reel in a big one through the ice. Winter is the best time to catch walleye, sauger and northern pike. Manitoba is a hardwater heaven! Be sure to prepare all necessary licenses and familiarize yourself with fishing regulations prior to your trip. In the 1920’s and 30’s, cold weather was an enormous obstacle for aerial access to the North. Now until the end of the month, head to the Royal Aviation Museum of Western Canada and dive into the lives of Canada’s air pioneers and the cold-weather transport airplanes that formed the foundation of today’s northern air industry. 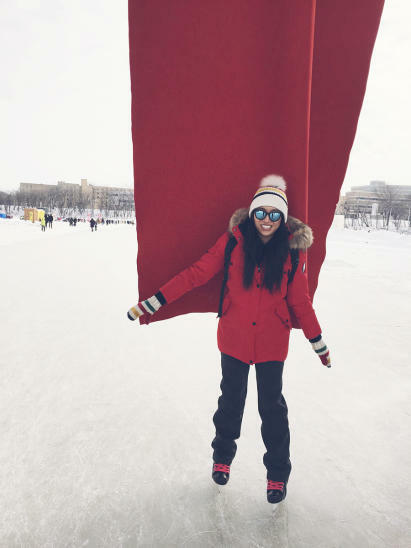 There’s a snow flurry of fun to be had at Assiniboine Park in winter! Visit your favourite furry friends at The Zoo, skate like graceful swans on the duck pond, fly down the Toboggan Hill, or enjoy the beauty of the park while skiing the groomed trails.